THIS book is written by Harold. His full time occupation is dog. He lives with Mr. and Mrs. X (here called Monroe) and their sons Toby and Pete. Also sharing the home are a cat named Chester and a rabbit named Bunnicula. 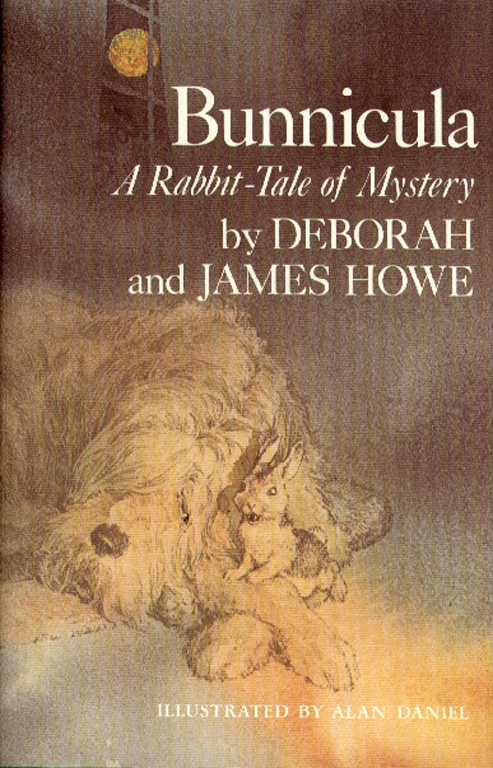 It is because of Bunnicula that Harold turned to writing. Someone had to tell the full story of what happened in the Monroe household after the rabbit arrived. It all began when the Monroes went to see the movie Dracula At the theater Toby found something on his seatÑa baby rabbit that he took home and named Bunnicula. It proved to be an apt name, at least as far as Chester was concerned. A well-read and observant cat, he soon decided that there was something odd about the newcomer. For one thing he seemed to have fangs. And the odd markings on his back looked a little like a cape. Furthermore, Bunnicula slept from sunup to sundown. He was awake only at night. When the family started funding white vegetables, drained dry, with two fang marks in them, Chester was sure Bunnicula was a vampire. But what to do about it. None of the family seemed to grasp the trouble, and Chester's hilarious hints were totally misunderstood. Was Bunnicula really a vampire? Only Bunnicula knows for sure. But the story of Chester's suspicions and their consequences makes uproarious reading.